Kapka Butte/Tumalo Sno-Park comments are important! We need you to write to the Forest Service stating your opposition to the Kapka Butte Sno-Park proposal and your support for the Tumalo Backcountry Recreation Zone. The deadline for public comment is February 1, 2009. The Forest Service is proposing the construction of a massive snowmobile sno-park at Kapka Butte. Under pressure from the snowmobile coalition, the long-standing plan to make Dutchman a non-motorized sno-park was suddenly retracted, and the agency currently has yet to develop a management plan to deal with the hundreds of additional snowmobiles that will be injected into the Tumalo area. We need you to comment on this proposal, voicing your opposition to this new sno-park unless equitable accommodations for non-motorized users can be incorporated. Comments to the Forest Service must be received before by February 1, 2009. We understand many of you have signed a petition supporting the development of a non-motorized zone surrounding Tumalo Mountain (the Tumalo Backcountry Recreation Zone, or BRZ). We truly appreciated your support, but the formal scoping process will only acknowledge individual comments received during the scoping process. If you value quiet winter recreation and view Tumalo Mountain as a valuable resource, the Forest Service needs to hear your voice by February 1, 2009. 1. The Tumalo Backcountry Recreation Zone (BRZ), a non-motorized zone surrounding Tumalo Mountain must be implemented in conjunction with any increase in snowmobile usage. The BRZ proposal defines an enforceable non-motorized zone with recognizable boundaries that encompasses Tumalo Mountain and the Dutchman Flat region. 2. The Kapka proposal no longer includes the longstanding plan to close Dutchman Sno-Park to snowmobile off-loading. The non-motorized sno-park at Dutchman should be reinstated. 3. Although the Kapka proposal includes the construction of trails for non-motorized users, few winter recreationists seeking a quiet winter experience will want to spend their time in such close proximity to a massive snowmobile staging area. Enhanced snowshoe opportunities on Tumalo Mountain would better serve these winter travelers. Likewise, the dog-friendly ski trails should be located away from this heavily motorized area. 4. The proposed Kapka snowmobile sno-park is excessively large, especially in lieu of the Forest Service's limited ability to enforce existing Wilderness, Watershed, and Dutchman motorized closures. 5. Any proposal for increased motorized access in the Century Drive corridor must be balanced by equitable accommodations for non-motorized users. 6. The goal of the Tumalo BRZ is to enhance accessible backcountry recreation, increase tourism opportunities, and provide fair and reasonable mitigation for the impacts associated with an increase in snowmobiles in the Deschutes National Forest. The BRZ still allows snowmobile access to the high country beyond Tumalo while providing a quiet, safe zone for non-motorized users near the trailhead. Additionally, accommodations for the Elk Lake Resort winter shuttle can easily be incorporated. Visit www.bendbc.com for additional information. Thanks for your continued support! P.S. : We have a goal of submitting 300 comments to the Forest Service. It just takes a few minutes to make your voice heard. But we have the numbers to succeed-if we all make an effort. The Forest Service is proposing the construction of a massive sno-park at Kapka Butte. This will add more snowmobiles to the Century Drive corridor but will not address the safety, parking, and access needs of skiers and snowshoers. We need you to comment on this proposal, voicing your opposition to this new sno-park and your support for equitable accommodations for non-motorized users. You’ll find more details below. Thanks for your support! The Deschutes National Forest is currently seeking public comment regarding the Kapka Butte Snowmobile Expansion Project, a new sno-park at Kapka Butte (the intersection of Century Drive and the Sunriver turnoff). The proposed Kapka Butte parking area is 100 feet wide and 1,600 feet long–twice the size of the existing Wanoga snowmobile parking lot. A lot this size will easily accommodate more than 125 trucks and trailers, providing capacity for 250 to 375 additional snowmobiles in the Century Drive corridor. 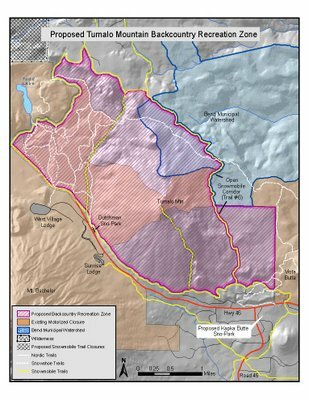 In developing the Kapka Butte proposal, the Forest Service has retracted the long-standing plan to close Dutchman Sno-Park to snowmobile off-loading, and has ignored the need and requirement to address inevitable user conflicts that will accompany such a massive increase in motorized use. The proposed Kapka sno-park will increase existing conflicts between motorized and non-motorized users. These conflicts not only include physical proximity and safety issues, but also noise and air pollution, and parking and access issues. Although the Kapka proposal includes the construction of trails for non-motorized users, most winter recreationists seeking a quiet winter experience are unlikely to want to spend their time near such a massive snowmobile staging area. Additionally, these areas offer no access to suitable terrain for backcountry skiers or snowshoers seeking more of a challenge. Most importantly, we believe that any proposal for increased motorized access in the Century Drive corridor must be balanced by equitable accommodations for non-motorized users. Therefore, we strongly oppose the construction of the Kapka Butte Sno-Park. As many of you are aware, we proposed the creation of the Tumalo Backcountry Recreation Zone (BRZ), a non-motorized zone surrounding Tumalo Mountain (submitted to Deschutes National Forest Supervisor John Allen on May 8, 2008). The BRZ proposal defines a defensible non-motorized zone that encompasses Tumalo Mountain and the Dutchman Flat region. The goal of the BRZ is to enhance accessible backcountry recreation, increase tourism opportunities, and provide fair and reasonable mitigation for the impacts associated with an increase in snowmobiles in the Deschutes National Forest. The BRZ still allows snowmobile access to the high country beyond Tumalo while providing a quiet, safe zone for non-motorized users. You can view the proposal and a map of the BRZ by clicking the Tumalo Backcountry Rec Zone link on the right side of this page. If you value quiet winter recreation, believe you have a right to the same access opportunities as motorized users, and view Tumalo Mountain as a valuable resource, the Forest Service needs to hear your voice. We understand many of you have signed a petition supporting the development of a non-motorized zone surrounding Tumalo Mountain. We truly appreciate your effort. But to make this a reality, we also need your support at every step along the way. Opposing the Kapka sno-park is one of those steps. Please write to the Forest Service stating your opposition to the Kapka Butte Sno-Park proposal and your support for the Tumalo Backcountry Recreation Zone. The deadline for public comment is February 1, 2009. I cannot support an expansion of snowmobile parking capacity without mitigation to address conflicts with non-motorized recreational users. Establishment of the Tumalo Backcountry Recreation Zone helps address these issues. The size of the proposed Kapka sno-park is far too biased toward snowmobiles and therefore doesn’t balance the needs of all user groups. Kapka Butte will have little value as a snowshoe destination due to its proximity to a major snowmobile staging area. Enhanced snowshoe opportunities on Tumalo Mountain would better serve these winter travelers. Likewise, the dog-friendly ski trails near Wanoga Sno-Play area are likely to be more suited to these users. The Kapka proposal does not include the closure of Dutchman Sno-Park to snowmobile off-loading, as originally planned. This is another example of the Forest Service’s failure to adequately accommodate multiple user groups. There are no plans to manage the increased snowmobile traffic that the Kapka sno-park will bring. Additionally, the current non-motorized zones around Tumalo are difficult for the Forest Service to manage and for users to understand. On the other hand, backcountry users don’t require management or policing. Snowmobiles can already be heard from all Century Drive recreation areas. Increasing the number of snowmobiles in the area without mitigating this impact is unfair to the thousands of non-motorized users who use these public lands. As the Bend area population continues to expand, changes are necessary to accommodate the increased numbers in all user groups. Snowmobiles already have access to hundreds of miles of trails and huge tracts of land. Skiers and snowboarders must have an alternative to paying for lift tickets or buying a snowmobile in order to pursue their activity. Skiing is an activity that should be accessible to everyone, regardless of their economic status. Compared to the cost of building a sno-park, the cost of implementing a non-motorized recreation zone is insignificant. Backcountry recreation opportunities support local businesses and tourism in the Bend area.